When I was in college I kept a rather interesting schedule that usually involved napping from midnight until 3am and then getting up to write papers and such. It was surprisingly successful, most of the time. I have since developed more standard sleeping habits. But I am finding that the occasional late night opens my brain up in interesting ways. It is definitely good for turning off my inner editor (especially when combined with a glass of wine or two) and ideas just seem to flow differently. I’ve always gotten ideas for stories and paintings and whatnot when I’m drifting off to sleep so maybe my nighttime brain is more creative than my daytime brain. It’s quieter at night, which helps. No neighbors with loud dogs and motorcycles, not as many cars driving by the window. Pedestrians pass by once in awhile, which is rather disturbing since you can hear every word through the windows and it sounds like they’re actually in the room. But for the most part it is quiet, just me and my typing and my iTunes and my tea and my kittens which is really quite a lot of things but it still seems mellow in comparison. I think it helps me better listen to my brain. My brain tends to be a non-linear mess of images and words and imaginings. I am still not entirely sure how it works. I have a very lousy memory. Seriously, I remember very little from those nocturnal college days and even less from days before that. If pressed, I could likely recount the events of last week but they might be highly fictionalized. I tend to live in the now and the five minutes from now and my grasp on anything else is tenuous at best. I don’t really mind. I’ve never been particularly nostalgic and I tend to assume anything and everything could happen in the future so the only really reliable time is the now. I’m not even sure how I got on this tagent. See what I mean about the inner editor? She takes nights off, obviously. Or she gets sick of me after midnight and goes off to do whatever inner editors do on their nights off. So that leaves me alone with all this stuff in my head and only my keyboard to take it out on (the kittens have given up on me and are asleep, Tessa is on the box of files to my left and Bucket is in the other room) and maybe that’s a good position to be in and maybe I should try doing it more often. It is 1am. It is quiet outside and the air is still humid with the summer heat despite the thunderstorm that passed by earlier this evening. A car just drove by, the first one in awhile. I have a necklace made of keys around my neck that jingles when I move like chimes. I suppose I should go unlock something. For my birthday last week I was given, among other shiny things, a lovely new paper journal. It was a gift from the Nicest Person on the Internet and it is fantabulous and has my initials on it, so it is special and mine. Here, let’s start the pictures rolling on this blog already. The kittens will be mad that they weren’t first, but they’ll get over it. The E.J.M. is hard to read because it’s shiny and gold. 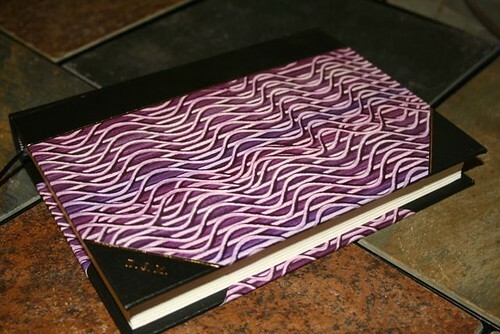 I love the contrast of the dark binding and gold embossing with the busy purple swirls. Like it’s a nice proper book with a crazy side. I have a weird complex about blank books. I love them. I spend a fair amount of time in bookstores pawing through the section with journals and sketchbooks and datebooks. I love the crispness of blank pages and still creaky bindings. I have a collection of them, acquired over several years, ones I’ve bought myself and others that have been gifted to me. Several of them are still blank. I get very intimidated by the possibilities of a blank journal. I can write anything in it so I end up writing nothing. I feel better about writing in journals that are cheap or boring. The pretty ones are the most intimidating, of course. I worry that my handwriting is not pretty enough to fill it, that I’ll use the wrong type of pen. And worse, that I’ll fill in a few pages and then abandon it. I can count the journals I’ve filled on one hand. I wonder if I have a short attention span. The thing is, I really like journalling on paper. I find typing easier, but I like putting ink on blank paper. I like not having to follow the lines. (I always prefer unlined journals to lined ones.) I write in little blocks or swirly lines and I draw little things in between sentences. I am always critical, perhaps too critical, of how the page looks covered in ink. Does it matter? No one is judging it save for myself. I like art journals as a concept, pretty pages of color and collage mixed with words and thoughts. I don’t have the patience for it, I think. Maybe someday, with the right journal and the proper supplies. For now I just admire the work of others. I think I worry too much about purpose. Purpose and cohesion. I think of each journal as a whole rather than taking it page by page. Maybe that’s why blogging seems easier. It creates its own whole and I can’t see the infinity of blank pages ahead. Any entry could be the last page. And any entry can be deleted. It’s a nice kind of freedom. A paper journal has a permanence to it. Maybe that’s why I find them so appealing in their blank state: permanence and possibility with a pretty cover. I think I have been editing for too long, and am getting to the point where I forget how much I actually enjoy writing. Figuring out what comes next, putting one word after another. While editing I’ve been getting bogged down with big picture things, with tying loose plot strings together in knots and making sense of the thing as a whole. I think the sense of mystery is gone, which is likely good for the novel but not so good for me. I know this story, these characters. It’s like I can see the finished statue in the marble so well that I’ve become impatient with chiseling and polishing and I really want to just whack the whole thing with a hammer. I keep telling myself to think of it more like painting, that I’m learning as I go and I’ve always had trouble finishing things. With painting it has become easier, I can see and feel when something is done. It’s all there, on a nicely contained surface with corners and I can see it all at once and acknowledge that yes, this is finished, this is complete. But it’s so much harder with pages upon pages of thousands of words, being unable to look at the whole thing at once. Working on one section and then another and still having dozens more that need attention. I suppose it is a matter of learning and gaining perspective, but I’m still finding it difficult. I started something new this morning. Just a couple hundred words about someplace different. I always start with place, I’ve found. The characters and the events come later, but the place tends to stay the most important. I like this new location, and I’m looking forward to spending time in it, to figuring out the mysteries there by putting one word after another. But I also need to learn to embrace the less surprising bits and not leave things incomplete and unpolished. To finish with the old places before delving too deeply into the new ones. First blog posts are always difficult. This one is especially problematic since I’m not entirely sure what I want this blog to be just yet. At least it looks pretty. I have been blogging in various forms for several years, though this is my first WordPress endeavor and I am vaguely overwhelmed with shininess and buttons. I’ll get the hang of it eventually. And because I have a penchant for significant dates, this blog has the same birthday as I do. Only it is zero years old and I’m thirty. I suppose, if nothing else, this is a new blog for a new-to-me decade of age. I am fond of the number three, and it has been a birthday of books and cupcakes and pomegranate martinis, so that bodes well. Hopefully this blog will figure out what it wants to be somewhere along the way. Though there will undoubtedly be pictures of kittens.